We were enchanted by the beautiful and peaceful mountain setting of this wonderful property. Ameli and Fermin are the most welcoming hosts, plying us with home-made produce and giving us lots of good advice about the local area. The village of Etxalar is about 90 miles from the port of Bilbao by fast motorways and main roads. Bagoleko Borda itself is another 4 miles from Etxalar up narrow country lanes. In all the drive from Bilbao took us about two and a half hours. The directions supplied by the owners were excellent. Bagoleko Borda s a traditional - and beautiful - Basque farmhouse. There are two visitor apartments on the middle floor. We rented apartment I, the larger one, which has three bedrooms and a large and well-equipped kitchen/dining/living area. All the facilities are excellent, wih dishwasher, microwave, conventional oven and hob and washing machine in the bathroom.The beds are very comfortable and the views from the balcony at the front are absolutely spectacular! There's a barbecue and outdoor seating areas - when we visited in August 2012 the weather was very hot. We enjoyed visits to Pamplona, the caves of Zugarramurdi and the beaches of Hendaye over in France. We also enjoyed sampling Basque cuisine - there's a excellent delicatessen in nearby Bera - and culture during the annual fiesta in Etxalar itself. 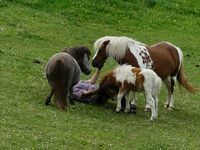 Fermin and Ameli raise cute miniature ponies on the farm and they are always happy to accept an apple or two! We had a wonderful week at Bagoleko Borda - thank you again Fermin and Ameli!